HELLO HUMAN SERVANTS, THIS IS TROUBLE THE KITTY. SOME OF YOU MAY HAVE HEARD RUMORS THAT I WAS DRIVEN OUT OF MY KINGDOM, ALSO KNOWN AS THE COUNTER IN THE GARAGE, BY A SWARM OF BEES. I AM NOW HOLDING A PRESS CONFERENCE TO ADDRESS THESE RUMORS. YES, SADLY, THE STORIES ARE TRUE. DURING LAST WEEK’S HEAT WAVE MY KINGDOM WAS INDEED INVADED BY BEES, AND MY HUMAN SERVANT DADA HAD TO COME IN THROUGH THE SWARM OF THEM AND CARRY ME TO SAFETY. I HAVE NOT REWARDED HIM FOR THIS BECAUSE SUCH SERVICES ARE EXPECTED FROM HUMAN SERVANTS. HOWEVER, I SOON GREW LONELY IN MY EXILE, SPENDING HOURS CALLING OUT FOR RESCUE, THE WAY I USED TO CALL MY SISTER POOH BEAR WHEN SHE FIRST WENT MISSING. EVENTUALLY I BEGAN TO LOSE MY GRIP ON REALITY. I AM TOLD I BEHAVED IN A STRANGE MANNER AND LAY DOWN IN INAPPROPRIATE PLACES, ALTHOUGH I HAVE NO MEMORY OF THESE EVENTS. NOT LONG AGO, WE SAW THAT OLD AGE AND CUNNING ALWAYS DEFEATS YOUTH AND EXUBERANCE. BE WARNED, “SOMEONE” AND “SOMEONE’S FRIENDS” — I AM AS OLD AND AS CUNNING AS YOU THREE PUT TOGETHER. PURR PURR PURR. ← Wordless Wednesday: Don’t Make Me Angry. You Wouldn’t Like Me When I’m Angry. Poor kitty. I am glad to see you are no longer in exile and have your throne back. it must have been difficult for you. 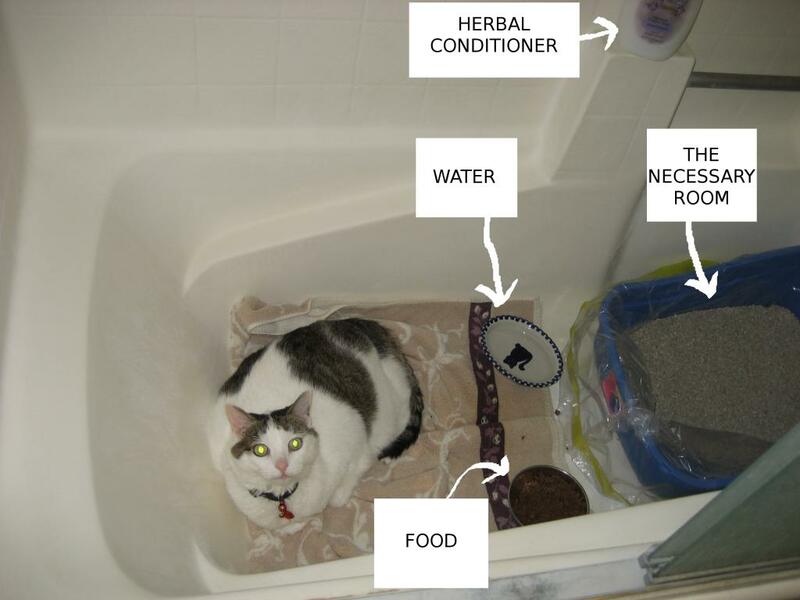 And I only eat cat food that has already been eaten first, by the way. Trouble, those Bad bees must learn that you are the only Queen Bee! Ohhhh Dennis, you are Going Down!!!! Bee afraid – bee very afraid!!! Thank dog you wewe able to wetuwn to youw own kingdom! may I have some of that honey pleez? Tuffy is one smart khanine! Oh Kitty Super Heroes!! Cool! Your dada is very brave to rescue you from the bees. How awful. You need to stay in the safe house as long as required to feel better. I am glad you were able to reclaim your territory – know in the future you can come over here for rescue if you need it. COME HERE KITTTTI KITTTTI, I just want to play, I want to be your friend. It is a shame your sister and brothers don’t want to come over and play with me… I am just a little Saint. glad yer dad saved you from the bees Harrrrr. So, the cat got you, right, Dennis? My cat, Ali Z, could do that anytime. Its best just to avoyd them. Trouble kitty, if you lay in that box, the dogs cannot get to the snacks!! 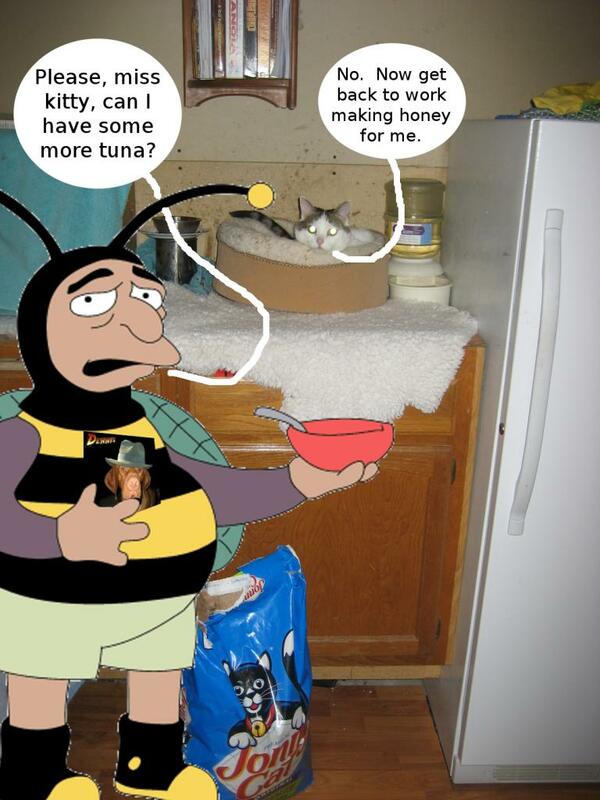 Dad says bees are PURE EVIL I dunno about all that, I think he is a big sissy. I hope you get your kingdom back soon, I am sure Dennis is waiting for you to get the heck out. Hey Trouble if you is done with the Thunderkittys can you send them over here? I jest need a little help over here there is too much evil (Star) and too menny bees (that Star is not eating) and not enuff hours in the day and it seems like you have a lot of contakts. If the Thunderkittys are too bizzy mebbe you could hook me up with HeMan or his fearsum sister SheRa or GI Joe the Amerikan Hero or the Silverhawks wut are partly metal and partly real. I will make it werth yer wile. OK thanks!! The bee man has my favourite shirt!!! Make him give it back or I’ll sent Super Postal Avenger to wreak havock!!! 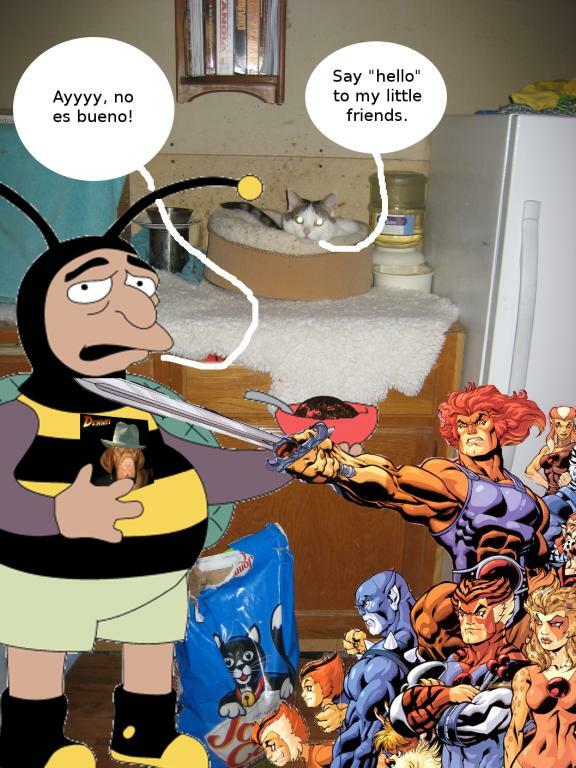 You, Cat, have been warned…..
Way to make that bee fall to his knees! You are one super kitty! Bees they are always crashing into somecats space. 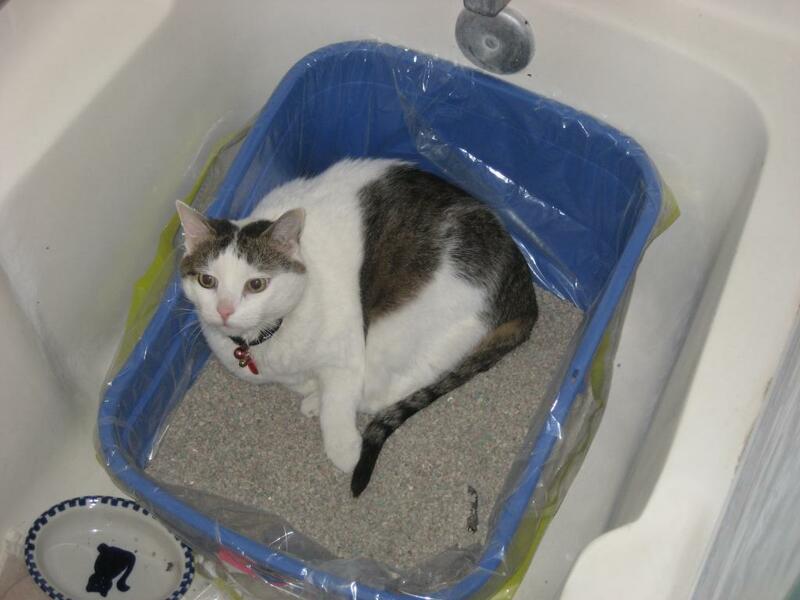 I am glad you got rid of them… living in the tub looks like the pits. I would hate being so close to my necessary room.. yuck.